Ukuleles are great instruments. They are much easier to play compared to other stringed instruments. But, “easier” does not mean “easy”. As with any new skill, there is a learning curve. 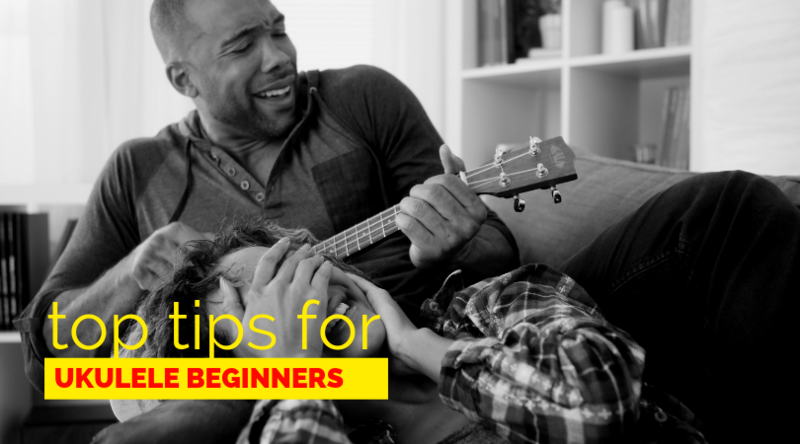 In this post, I share my top tips for ukulele beginners; they will help you reduce the learning curve and become a proficient ukulele player faster. The most important tip of all, is to have fun. Learning any musical instrument can be frustrating. I’ve been through it, and you will too. We want to progress quickly, but end up getting stuck and feeling despondent. We can find ourselves saying things like “it’s too hard”, “I’ll never do this”, “I’m not good enough”. When this happens, don’t listen to your inner voice. It will make you want to give up. Instead, turn your inner voice into positive self-talk “I can’t believe how much I have progressed”, “I love learning new skills”, “Every time I practice, I am improving”. This will make ukulele playing more fun. And who wants to give up on something that fun? Nobody. If you can have fun and enjoy yourself, it will stop the emotional ups and downs so you will learn much faster. It can be tempting to practice for long time periods and then wonder why you’re not making fast progress. This is because we are human; it takes a while to train our brains and bodies to do new things. It is much better to practice for 15 minutes each day than 3 hours once per week. You are trying to develop muscle memory. Practicing the same thing each day will help this to grow quicker. If you miss a few days, don’t beat yourself up and don’t try to catch-up. Just pick up again with the regular small chunks of time. Most people start with very cheap ukuleles, these are poorly constructed, hard to play and rarely stay in tune. You might be doing all the right things, but if your ukulele sounds terrible, you will assume it is you who is wrong. That certainly won’t help you develop. Check out our guide buying a great ukulele. Ukulele’s need tuning regularly. It does not matter if you have a high-end or budget ukulele, it will sound bad if it is out of tune. If the sound is out of tune, you will assume it is your playing which is bad. An expert with an out of tune ukulele will sound bad too. I can’t stress the importance of being in tune. If you’re looking for an electric tuner, the KLIQ Uber Tuner is a great option. Check out our guide to tuning a ukulele. How quickly can you go from thinking about playing to actually playing? If your ukulele is stored in a case, which you keep in the garage, it will take 2 or 3 minutes to be ready and another 2-3 minutes to pack away. Guess what, you won’t practice much because you’ve put too many time barriers in the way. Holding a ukulele correctly will ensure your hands are in the right place to play. But, hold it incorrectly and you will constantly be compensating by putting your body in awkward angles. This will make the uke harder to play and can cause a lot of muscle tension and stress. Every time, before you start playing, check your holding position. It will feel strange at the start, but after a while it will become second nature. Eventually, you will be able to play even while walking around. One small point, only apply the necessary arm pressure to hold the uke into place. If you squeeze it too tight it will cause additional muscle strain. If you really struggle, then a strap is an option. But imagine somebody asking you to play their ukulele and you can’t because it doesn’t have a strap. Therefore it is much better to master the right technique first, use a strap if you wish. Ideally, the fingers of your fretting hand should be end-on to the string. On a ukulele, there is very little space between strings, so if your fingers are at an angle, they can mute the other strings. Therefore short fingernails will help to get the correct finger placement. Conversely, the fingernails on the strumming hand can be left a little bit longer if you wish. This will help to create a different tone as you strum the strings. Good music has a variety of critical elements. One of the most important is rhythm. Shall I let you in on a little secret? If you play an incorrect note, often people don’t notice, but if you play out of time, everybody notices. For the beginner ukulele player, this means being able to strum in different patterns at the right speed. Initially strumming techniques will involve a mixture of down and up strums. Once you’ve mastered that you can add some extra pizzazz with palm muting, percussive, and choked strumming patterns. Start listening deeply to songs and hear the feel and groove of the music. Soon you will be able to play them without even needing to think about the strumming pattern; it will just flow out of you naturally. At the start, it is difficult to get your fretting fingers in the right place. You have to concentrate so much that it is hard work. It won’t be like that for ever. You are training your muscles to form the shapes, after a while it takes very little thought, then after a while longer, it happens almost without thinking. It can be tempting to practice fast in the hope that your fingers will catch up. Instead of developing, it will cause more damage. They say that “practice makes perfect”, this is incorrect, it should be “practice makes permanent”. If you practice with bad technique, you will perfect bad technique. You want a clean, crisp tone with no buzzing or muted notes. So you want practice accuracy, rather than speed. Play at a tempo that you can manage, then slowly increase that over time. A ukulele is a musical instrument, which means we interpret how good it sounds by using our ears. If it sounds good, then it is good, it’s that easy. It can be difficult to hear yourself when you are playing. Try recording yourself on your mobile phone, then listen back to it. You will notice things which you never realized about your playing. Remember, you are recording on a mobile phone, so don’t expect studio quality recording. It is there to help you, not to give you an excuse to listen to your negative internal voice. From my experience, as soon as the recording starts, my playing changes. There is suddenly pressure to get it right. This is good pressure, as it will help you to play in more pressurized situations in the future. Play with others before you think you are ready? How does the thought of playing with others make you feel? Nervous… right. What if they think you’re not very good. What if they laugh at you? This is self-talk once again. You will learn so much by playing with others. Don’t wait until you feel ready; if you do, then you will never get to play with others. Just do it and enjoy yourself. No matter what stage you are at in your ukulele playing journey, there is always something to learn. However, these tips have been specifically selected for the beginner, to provide the best chance to succeed and maintain motivation. What are your top tips for ukulele beginners? Let me know.